The Brenner Base Tunnel is a horizontal railway line running through the Alps. 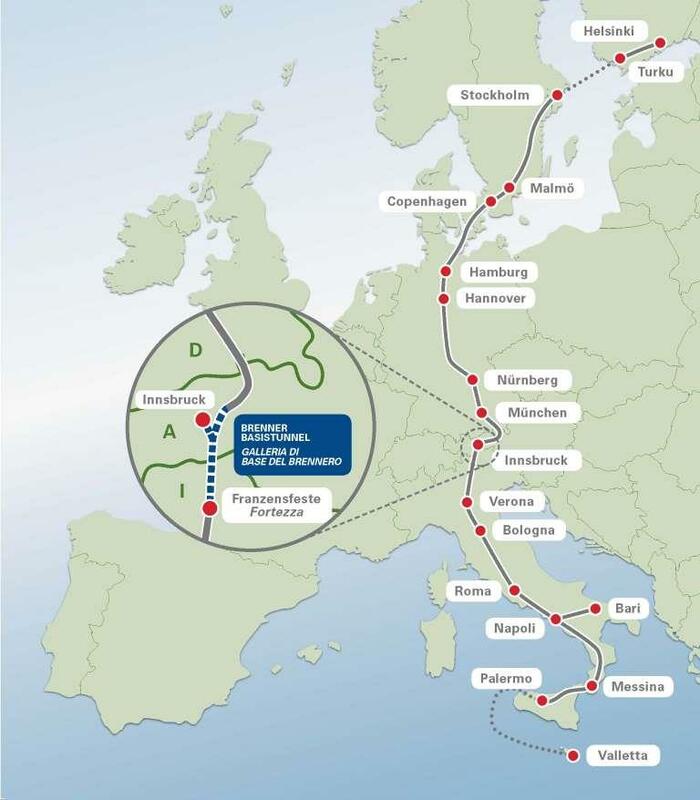 It is the main element of the new Brenner railway from Munich to Verona. 64 km long, it is the longest underground railway connection in the world. The BBT is designed primarily for freight transport, allowing a modal shift of traffic from road to rail – although passenger trains can also travel through the tunnel. Thanks to the virtually horizontal tunnel, train traffic will no longer have to contend with the steep up and downhill slopes on the 140 years old Brenner railway line. The BBT consists of two tubes, with an inner diameter of 8.1 m, run 70 m apart from one another. These tubes are each equipped with a single track, meaning that train traffic through the tubes is one-way. The two tubes are linked every 333 m by connecting side tunnels and can be used as escape routes in emergencies. This configuration ensures the highest security standards for tunnels. The main purpose of the Brenner Base Tunnel is to reduce the amount of heavy-load traffic on roads by shifting some to rail. It will be constructed between Innsbruck Hauptbahnh, Austria and Franzensfeste (Fortezza), Italy, BBT will become the second-longest tunnel in the world with a planned length of 56km (35 miles). In other words, Gotthard Base Tunnel, between Italy and Switzerland is just a kilometre longer than BBT. On July 10, 2007, Austria and Italy signed a memorandum of understanding to support the BBT project for shifting the traffic from road to rail. The tunnel project was submitted for authorization in spring 2008 and the government approved it in 2009. In September 26, 2015, in Inssbruck, at the Tulfes Pfons lot at the Brenner Base Tunnel, in the presence of Mr Günther Platter, President of the Tyrol Region, the ceremony for the start of the excavation works with TBM was held. The project is funded by Austria and Italy, and a contribution by the European Union. Due to the magnitude of the project, the funding promised so far will not suffice for the estimated costs. It is scheduled to be completed in 2025. The whole project is worth €8.8bn. A consortium led by Astaldi has been awarded a €1 billion contract to deliver the Italian side of the Brenner Base Tunnel (BBT). The consortium, which also includes Ghella, Oberosler, Cogeis and CAP, is responsible for all tunneling works on the Italian section of the tunnel and is expected to be finished in seven years from now. The contract includes the construction of an exploratory tunnel as well as the two main 23-kilometre railway tunnels and construction includes both the use of tunnel boring machines (TBMs) and traditional techniques. The Tulfes-Pfons construction lot, worth € 380 million, was awarded to the Strabag/Salini-Impregilo bidding consortium in summer of 2014. Excavation works began on the project in September 2014, with a completion date currently set for spring 2019. The construction includes 38km of tunnel excavation work. The process encompasses several structures including Tulfes emergency tunnel, Innsbruck emergency stop with central tunnel and ventilation structures. With a value of €104 million, the Wolf construction lot was awarded to the Swietelsky/Swietelsky Tunnelbau bidding consortium in autumn 2013. Excavation work on the Wolf access tunnel commenced in December 2013, and is due for finalization at the end of 2017. As mentioned, the whole project should be finalized by 2025. Once completed, the Brenner Base Tunnel will be the longest underground rail connection in the world. A great advantage is that travel time from Innsbruck to Bolzano will be reduced from 2 hours to 50 minutes, as trains will be able to pass through the Alps much faster.